I tend to write in the morning, very early. In fact, right now, it's just after 7:00am. The day will begin soon. However, I bask in the half light, that time after night and just before day - twilight in reverse. Animals who are up and about, at this time are called crepuscular. Not actually nocturnal or diurnal, they feed, wander, muse, perhaps even write, for those of us who can read their tracks, in this eerie half light. Rabbits, for example, are crepuscular, as are deer, moose and bears. In fact, we can become even more definitive. Animals who are active only in the early morning are matinal and those, who venture out in the evening, are vespertine. So, I guess I'm matinal, because I rarely write in the evening, though as words go, I would prefer to be known as vespertine. Matins, if you remember, is the morning prayer service and Vespers, the evening service. These crepuscular services were offered at a time when people prayed more often or on a more regular basis. In fact, I can remember reciting the Angelus, the prayer at noon, in school, for many years. Well, the sun must be up by now, though the sky is thick with a cover of grey clouds. Not only is it morning, it is also the first day of a new month, February, and I forgot to say "white rabbits." I guess it's time to go out and read his tracks. Now, we all know what happens to people who follow white rabbits. Wish me luck! The picture? 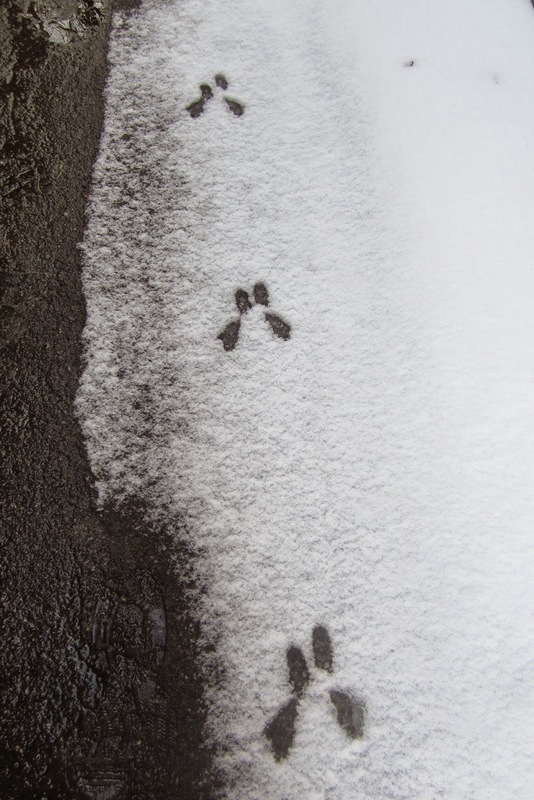 Rabbit tracks in the snow, messages from the half light.